Two Rounds of multiplayer pod play using our league scoring system. A player at each pod, each round is awarded a random prize (usually a booster). The Top 4 point earners for the event are awarded packs based on attendance. All entry fees are totaled for the month. The top 6-8 players split an amount of store credit equal to the total entry fees for the month! To communicate with other local players or to see our scoring system please join our NC Gamers Guild Commander Group on Facebook! 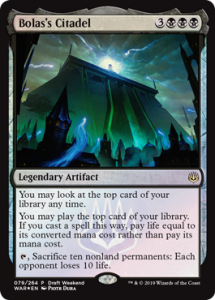 5-3-19 War of the Spark Release Draft! Experienced Players: Bring in a new player. Help them register a DCI Number. Teach them how to play with the Welcome Decks. 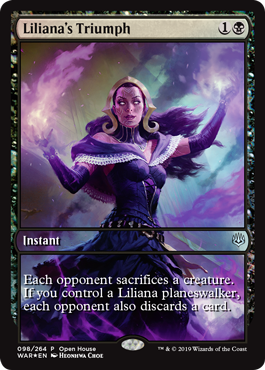 Receive a Promo Foil Full Art Liliana’s Triumph while supplies last. 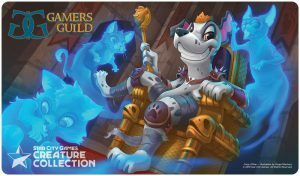 Receive a booster pack when your new player turns in match card. New Players: Register DCI Number. Receive a Welcome Deck. Learn to play from experienced player. Play (4) games with the Welcome Decks against other new players. 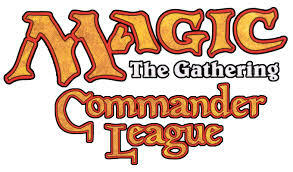 Turn in match card to receive a booster pack and promo while supplies last.